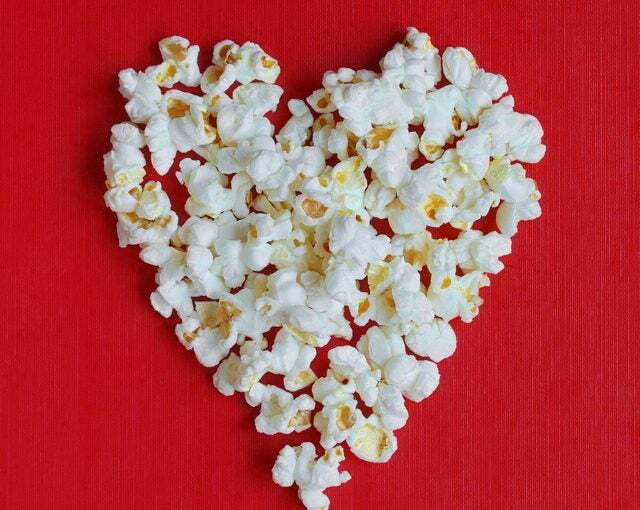 We stumbled across this fantastic recipe for a Valentine’s Day themed popcorn treat. Combining sweet and creamy white chocolate with conversation heart candies, this recipe really is a perfect balance of sweet and salty when mixed with lightly salted popcorn. This is a perfect snack to enjoy while cuddling on the couch with your loved ones. This recipe has been adapted from Gimme Some Oven. 1) Set up a double boiler to melt the white chocolate chips. Or microwave in 20 second intervals, stirring in-between, until fully melted. 2) In a large bowl, add the (popped) popcorn and then cover with the melted white chocolate. Mix thoroughly. 3) Cover a baking sheet with wax paper or non-stick aluminum foil. Spread the popcorn chocolate mix across the baking sheet. 4) Sprinkle the popcorn on the baking sheet with the salt. Then sprinkle on the conversation heart candies. 5) Let the mix cool for 10 minutes (approximately – just long enough for the white chocolate to harden). 6) With clean hands, beak up the popcorn mix into small pieces and serve. If stored in an airtight container, this mix can last up to a week!